The Oregon State Police provided this shot of one of the crashes on I-5 Monday. 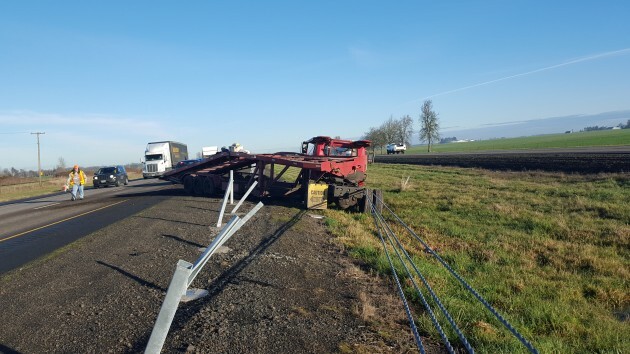 About 6 on Monday morning, the state police said, a 46-year-old man from Salem was driving south on Interstate 5 near the Boston Mill Road overpass in Linn County when he apparently passed out or died at the wheel of an undetermined cause. His Kia SUV drove off the road to the right and eventually got stuck in a muddy field. That should have been the sad end of it. But no, other drivers evidently slowed down, congestion ensued, and there were three more crashes involving seven vehicles, the latest at about 10 a.m., nearly four hours after the first. The state police said the additional crashes “occurred as a result of traffic congestion in the area.” They were being kind. Congestion does not cause crashes. Inattention does. In all three cases, vehicles had to slow down and others either plowed into them or had to brake so hard they lost control . In the second of the additional crashes, an empty truck towing a car trailer was in the left lane, didn’t slow soon enough, braked hard, jack-knifed, hit an RV towing a Jeep in the right lane and then slammed into the cable barrier to the left. Judging by the picture, the cables kept it from careening farther into the median, perhaps even from entering the northbound lanes and causing more havoc there. ODOT had the cables strung about a year ago under a $7 million contract covering 42 miles of freeway in Linn and Benton counties. This was after there had been 35 reported crossover collisions on I-5 in Linn County alone from 2008 through 2013, resulting in four deaths and 43 injuries. The description you give seems to present evidence to my largest concern of other drivers — they do *not* allow enough space between them and the person in front of them. So it is a combination of inattentiveness *and* driving too close to the person in front of them. I see this every time I’m on the freeway. As I came home from Portland on Sunday, I saw a row of 6-7 cars all in the passing lane (I was in the right) with what had to be less than 1 second of space between each car. If just one car braked for some reason, all would have crashed. I have pointed this out to my daughters as I taught them to drive. Lack of space kills. I never see this pointed out as a cause of accidents in reports, yet it is so. I have had a discussion of this with some folks (who I believe drive this way), and they have said that space doesn’t matter. As evidence they site race car drivers as proof. He sincerely seemed to believe this supported such driving habits on the freeway — which have non performance cars, non professional drivers, and commonly distracted drivers. I’ve seen many of these “car haulers” that appear to maintained to the barest minimum, driven by idiots that seem to have no concept of stopping distance. Looks like placing the cable at the edge of the shoulder (instead of at median center) was a good move. Having a reduced speed for trucks is usually a good thing. Even the best-maintained units take longer to stop than a passenger rig. While all of the above comments are justified, I sometimes wonder at the necessity of the mass of police cars that assemble at any event like this. They congregate, all with massive numbers of bright flashing lights and remain on-scene for an extensive period of time. While perhaps necessary, this adds to the natural inclination of passers-by to “rubberneck” at the scene; thus adding to the potential for additional accidents. Just sayin’.